APPROACH: It can be approached by road, river ways and railway up to Sultaanganj then river sand water crossing for walking distance. LANGUAGE: Hindi and Angika, English is spoken by educated people. LODGING: Middle class hotel, Dharamsala and lodges are available. DRINKING WATER: Drinking water is available, however the taste is less sweet. RO systems are trying to solve the problem. LOCAL TRANSPORT: Auto rickshaw, cycle rickshaw, horse wagon etc. 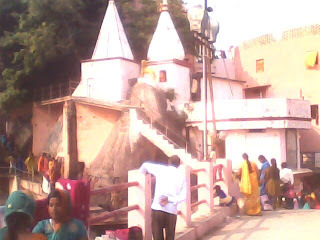 ABOUT THE SITE: The site is temple of lord Shiva on river island of the river Ganges. 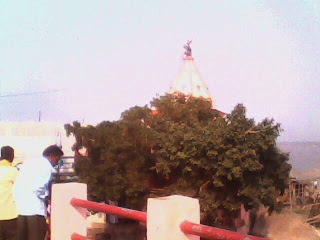 Unique about the site is that it is made up of granite rocksand Rajmal trap on which the temple is situated. It is a place where the Ganges turns towards north. According to Hindu philosophy and belief the Ganges water becomes more pious at such place. That is why a system of worship of Lord Shiva, by taking water of the Ganges at Sultanganj in metallic or earthen water jars or vessels attached with a wooden bamboo and pouring it on Shivlinga at Baidyanathdham or Deoghar is prevalent. This water carrying instrument as a whole is known as Kawar and the person who carries it is known as Kawaria. This ritual is followed enthusiastically in the month of Shawan (rainy season). The kawaria covers the distance of more than 100 kms on foot while observing this ritual. Other nearby sites--- Jahnwi ashram According to mythology one saint Jahnwi used to meditate near the site . Whenthe ganges was following Bhagirath on her way of flow towards Ganga sagar near the ashram (convent) of Saint Kapil to give solace to his burnt ancestors, Jahnwi”s meditation was disturbed. so he drank the whole ganges. Bhagirath again sat on tapasya (religious meditation and immediately got Ganges released. The saint (rishi Jahanwi) then exited ganga through his thighs. So one of the name of the Ganges is Jahnwi. This is another site at Sultanganj. A mosque is situated at the top of the hill. Tunnel and caves—Remnants of tunnel and caves can be seen on both Ajgaibinath and the Murali Pahar hill where saints used to meditate . Four stone statues and idols—of Hindu and jain gods are frequently seen on both the hills. Five Inscriptions on stone—Inscription probably in Pali script and the same language is also seen frequently on the stone slabs.